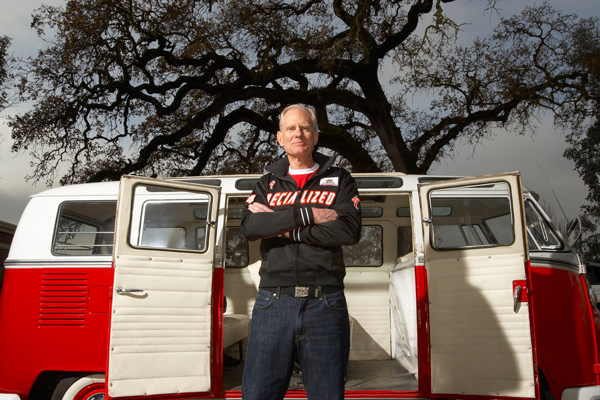 Specialized CEO and founder Mike Sinyard is no stranger to skepticism. When the company’s Stumpjumper, the first mass-produced mountain bike, hit the market in the early 1980’s, plenty of people wondered if it would go down in history as fad or failure. But the bike became wildly popular, created a new legion of bike riders and set the table for Specialized’s rise into a leading global bike company. PeopleForBikes sat down recently with Sinyard to learn about Specialized’s commitment to embrace the emerging electric mountain bike (eMTB) market. PeopleforBikes: Why did you lead Specialized in designing and manufacturing e-bikes and eMTBs? Mike Sinyard: Initially, my response was “no way.” We are purists for bikes, and at that time, I thought e-bikes would dilute that. But then people within the company asked me to just try it. And once I tried it out, I realized you can still get a great workout but go faster or father. I realized how empowering it is, and with our pedal-assist bikes, we realize it’s still you, only faster. PFB: How did your staff react when tasked with designing what would become the Turbo line? MS: As I mentioned above, we had pedal-assist believers on the team who stood behind their vision of developing an ultimate pedal-assist bike. I like to say, “let the ride decide.” Once you ride it, you’re automatically a believer. PFB: What kind of leadership do you hope to provide in the emerging e-bike market? MS: We hope that riders ride responsibly. Understanding, in the USA, that trail access can be a challenge, we are working closely with our retail partners to encourage riders to ride responsibly and help provide information on legal trails and trail etiquette. We also look to learn from our European markets, where e-bikes are not only accepted but embraced, and look at their best practices for sharing trails and accessibility. PFB: Proponents of e-bikes generally tout three reasons to embrace e-bikes: a “greener” form of transportation, a way to get more people on two wheels, and the potential to cover more ground. Opponents cite reasons not to embrace the technology: e-bikes are “clunky” and difficult to repair, they have the potential to cause user conflict and safety issues, and they damage trails. This new technology is not slipping in under the radar. As an industry leader, how do you speak fairly and rationally to both sides of the table? MS: In regards to eMTB use and trail damage, as seen through third party studies, there is not a difference on the impact on trails between pedal-assist MTBs and traditional pedal MTBs. The Turbo Levo, our pedal-assist MTB, does not have a throttle. It has to be pedaled like a normal bike, and handles just like a traditional MTB. Our team worked to keep the Turbo Levo’s geometry and feel close to that of our Stumpjumper and developed the Mission Control app to help eliminate range anxiety and tech issues. The bike requires maintenance that’s comparable to a normal MTB. When we decided to enter the eMTB market, we knew we wanted this bike to perform and look beautiful. Finally, stepping back from the pro or con side, I think it is important for people to see the health benefit of the pedal-assist bikes. Someone who might not have tried mountain biking because of health or fitness issues now can with the added assistance. It’s important to look at the big picture, hold each other accountable for riding responsibly, and working with the outdoor community so all trail users are able to enjoy their activities in a safe and respected manner. PFB: Is the opposition to e-bikes any different than early opposition to mountain biking? They do parallel each other quite a bit. When MTBs first came on the scene, the opposition was from the hikers and equestrians, and having to share the trail. But over time, the parties have been able to work together and ultimately learned that bikes were not going to destroy their trails. PFB: Why do YOU like to ride an e-bike? What’s the most fun e-bike ride you’ve done? MS: I love to ride my Turbo Levo and appreciate getting to ride areas or distances I otherwise would not be able to. Moab was the most fun spot I have ridden a pedal-assist bike. Once you develop the skills to get to go up some of the climbs that look and feel like a wall, you can do it with the assistance of the Turbo pedal-assist. Betsy Welch is a writer and rider from Lyons, Colorado who finds that most of her favorite things—good food, compelling conversation and beautiful places—can be easily discovered from the saddle of a bicycle.